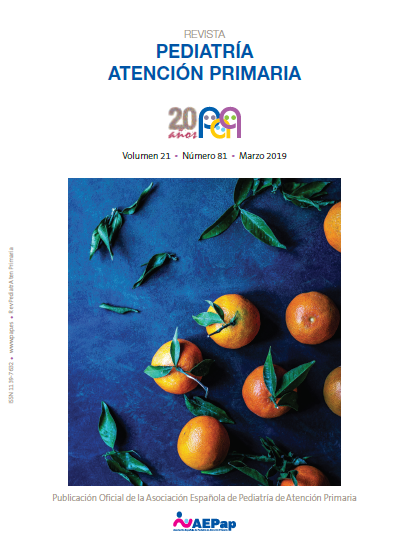 Praena Crespo M. Asthma in children and adolescents (controversy): Primary Care versus Hospital Care. In favour of the management by Primary Care. Rev Pediatr Aten Primaria. 2014;(23):11-6. What do we mean by childhood asthma? Praena Crespo M. What do we mean by childhood asthma? Rev Pediatr Aten Primaria. 2005;7 Supl 2:S13-27. Praena Crespo M, Jiménez Cortés A. Drugs to be used by the Primary Care pediatrician in childhood asthma treatment. Rev Pediatr Aten Primaria. 2005;7 Supl 2:S49-77. Yaque M, Castillo E, Praena Crespo M, Sancho C, Fernández A, Herrera C, et al. Factors related to starting breast-feeding in our population. Rev Pediatr Aten Primaria. 2000;2:35-46.